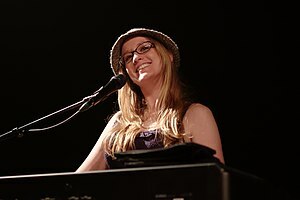 Great song, with a great chorus, features indie singer songwriter, Ingrid Michaelson doing her song “Do It Now” from her 2012 album “Human Again”. This is her 5th studio album. Her songs are regularly featured on major network TV shows, such as, Grey’s Anatomy, Bones and Vampire Diaries. This entry was posted in Indie Music, Music, Singer Songwriter, Song Of The Day and tagged indie music, IngridMichaelson, Music, Singer-songwriter. Bookmark the permalink. Loved her Be Ok album. This song reminded me a lot in parts of Joan Osborne What If God Was One Of Us, but perkier.